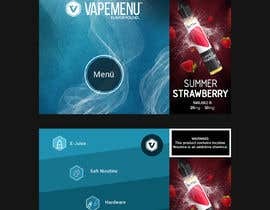 We are currently working on a next generation version of Vapemenu with additional features and powers, and want a COMPLETE REDESIGN of our application UI to take our app to the next level! We have five concept pages that we want redesigned: You can design them in any format that you like, we are most concerned with concepts. 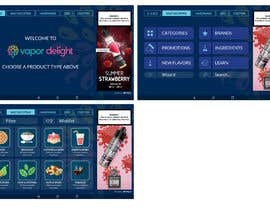 ***** Looking for design mock ups that demonstrate innovative, visually appealing, modern, clean, intuitive, and unique designs - don't mock up the same thing we provided! 1. 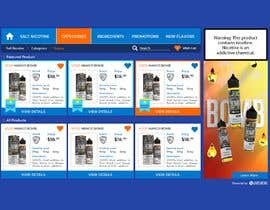 The Advertising banner on the right hand side of each page cannot be changed in terms of sizing (so length must be full page and width should be close to what it is). 2. 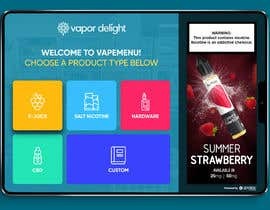 Our main goal is to highlight this advertising so if you come up with a visual way to highlight that banner (border, etc) then that will be taken into consideration. 3. All content that you see on the existing pages must be included in your redesign - so if you see any words or features, please make sure to include them in your design. 4. We have attached icons and images for you to use in your design. a. 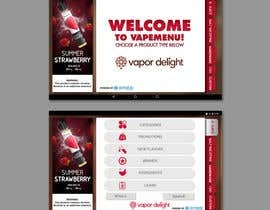 **“Vapor Delight” logo is sample store logo - you can change placement. Logo attached. 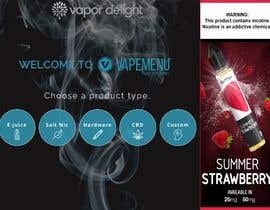 **“Vapor Delight” logo is sample store logo - you can change placement. Logo attached. 3. Category Screen: Sample icons are attached. Feel free to create your own icons! a. 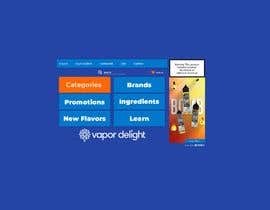 “Featured Products” are listed on the top row of this page. 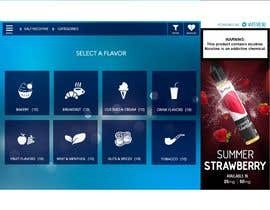 We are looking for a way to highlight these products through the UI. b. 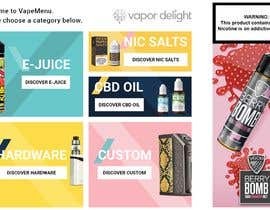 “All Products” are the products that are not being advertised through Vapemenu. 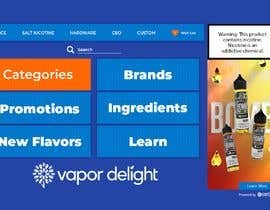 They should still look good, just not as good as the Featured Products. a. 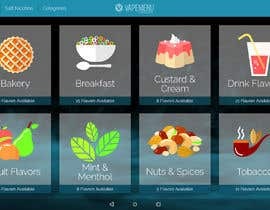 This page shows the User detailed information on the product. The image area should have a White background since the majority of photos are .jpeg and have white backgrounds. Update: We have a couple of designers from the submissions that we are working with to decide the winner, so please do not submit any more entries. Thank you! Sorry Pelinsu - at this point we wouldn't have enough time to discuss edits to your design :-( good luck on other projects! Hi, If you share your feedback on my design #35 that will help me to move to next step of your design together. Hi Nich, thanks - your entry was considered but we found some other designs that were very close to what we are looking for so we are working with those designers. We appreciate your efforts! Thanks Nihal we replied on one of your entries. We appreciate your efforts but have decided to move forward with one of the other entries. Thanks but your entry did not include any of the requirements and was not relevant to the contest. #extended please extend it for 1 more days. Do share feedback on 27 , while designing all the three environments are kept in mind, the lounge, bar, shops. The theme expandable to any number of items or features. No problem, we won't select until the final day of the contest but the sooner you get something in the sooner we can provide feedback. Thanks! Looking forward to receiving your entry! How do you monetize your ads, by per view, per no. if view, monthly or weekly. 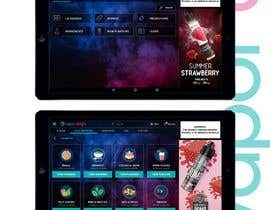 It is important because it will mean more number of screens which in turn will display more number of ads. or 2. do you pull dynamic ads according to timer ? Hi Mohd, we offer different options based on Advertiser preference. Very Interesting! Working on it now. Thanks John, I provided some replies to your submission! Hello everyone, please make sure that you provide a concept that is DIFFERENT than ours! We want to see something more modern, clean and updated than the one we provided. Thank you! Hi, I'm very interested in this project, I'm starting to working on it. please wait for my entry. Thanks! Any format is fine, please just make sure to read the requirements which I can see some applicants did not read. Thank you! I have no problem working on Photoshop but today there are better software to make mockup's for app's and sites, like Adobe XD or Sketch. Can I do it in Sketch or XD, or does it have to be in Photoshop? Hi Ricardo, you can do it in any format you prefer, thanks! Yes PSD is all we need. 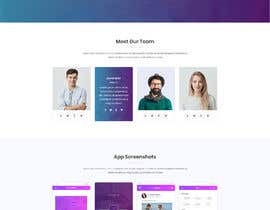 We want to select a new design idea, we are doing all development.